This pedal isn't cheap, but there's no snake-oil here: one of the more sophisticated and characterful overdrives we've tried. Warm, natural overdrive tones. Ideal for classic rock and blues. 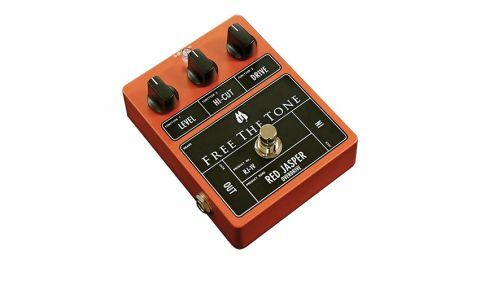 Billed as Free The Tone's first 'low-gain overdrive', the Red Jasper is similar in size to its Heat Blaster HB-2 distortion with a fairly wide 100mm die- cast enclosure. Inside, you'll find what the Japanese effects maker calls its Holistic Tonal Solution circuitry, which runs off a 9-volt centre-negative PSU or battery, while current draw is a fairly hungry 15mA. "Free The Tone says its HTS circuitry combines the best aspects of true bypass and buffered circuits"
For the uninitiated, Free The Tone says HTS combines the best aspects of true bypass and buffered circuits. In brief, the circuit filters out noise from redundant frequencies in the input signal and also features a noiseless on-off switch. It also ensures that the output impedance of the Red Jasper remains constant when it is switched on and off. Control layout is simplicity itself with Level, Hi-Cut and Gain dials the only tweakables. Designer Yuki Hayashi told us that both the natural overdrive of cranked valve amps and Klon's Centaur inspired the pedal's sound - although we'd say the Red Jasper is less glassy and toppy than some Klon-inspired pedals out there, with an extremely musical, flattering character all its own. It seems to work best plugged into smallish EL84-based amps, producing a detailed drive tone with an incisive edge but an open and airy bloom. Plugging in to a 6L6-powered amp with more headroom accentuated softer fuzz-tones at the cost of some bite and definition. We got the best results here by using the Jasper as a clean boost, with gain low and level high, to sweeten and lift the amp's natural tone rather than as a full-out overdrive. If you want an overdrive pedal that thinks it's a good amp, this could be for you: warm, natural- sounding drive tones that will suit blues, jazz-fusion and classic rock to a tee.